Since my last posting, we managed to get Cast On uploaded. This time it went a lot smoother so I am hoping this trend continues. We are trying to get back on the previous publication schedule so I've been working on Summer at the same time. The good news is that all of this hard work will pay off for Fall. It is odd but I haven't received many lessons to review in the past two weeks but I've got quite a few new students. I imagine things will pick up soon. I got a message a few weeks ago from someone wanting my advice about how to improve the looks of an applied I-cord edging. I had to laugh. This is something I have failed to masters. I've never been satisfied with my ability to do this type of edging and being the person I am, I've spent hours researching it. My solution is to replace an I-cord edging with a double pick up band. I like them better. Again, this is a personal thing. I'm not trashing I-cord edgings, just my ability to do one I'm happy with. Quite a few years ago, I was working on a baby sweater as a gift and I thought it would be nice to have the band look as nice on the WS as it did on the RS and after research I discovered Katharina Buss' method in Big Book of Knitting. The problem with her method was that you picked up the stitches as normal and then got a second needle and found the bumps of the band on the WS. Since the sweater was knit on Size 2.5mm needles and was in a dark color, I found that if I wrapped the yarn around not only my project needle but also a smaller needle held behind the fabric that I had stitches on both side of the neckline. I teach this is a finishing class and students really love it and find all sorts of uses for it. I've used it for a band similar to an I-cord for many projects. The following photos show a variety of ways to finish off the double band. These two photos show the RS & WS of a double pickup. To complete the double bind off you have to work the stitches on the front needle with those on the back. In this case, a three needle bind off is used. If you want something that more closely approximates an I-cord, you can use a Kitchener stitch to close the stitches between the front and back needles. 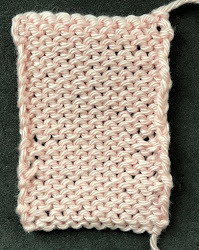 In this sample, the stitches have been bound off purlwise. I finished the skirt and top. I haven't blocked the top yet. If you look closely you can see all of the stitch markers still in the top. I haven't written the pattern yet. I don't really take notes. I write the pattern from the markers. Now I have time for other projects! Thank you for the video. I'll use this bind off for the top I'm working on.